Talk about time travel – that is what the last two months have seemed like. The speed of the days passing by is amazing – where have these two months gone since I last posted. So while we have been well occupied its also been in a relaxed and easy-going kind of way. 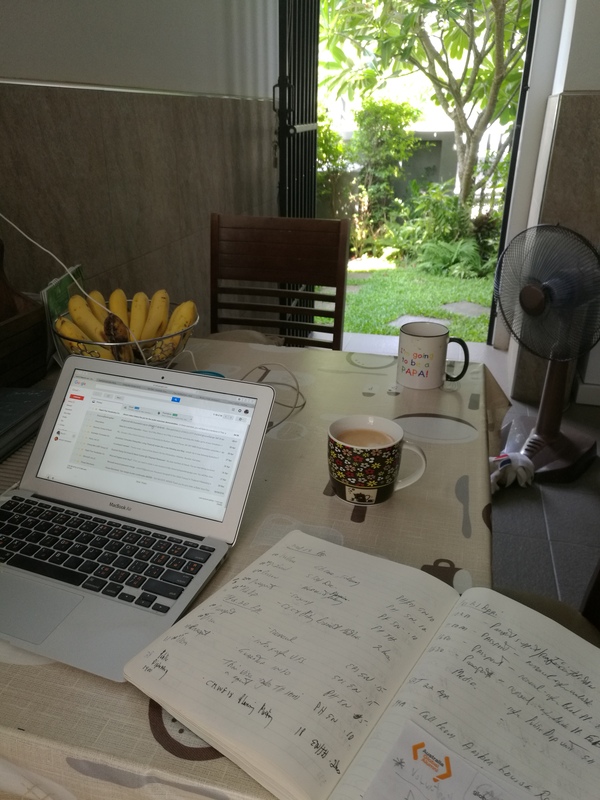 I am loving the ease of working from home and open air office concept. Now its July, the weather has changed from the late April and May heat – when the days were often 43 degrees. The green or wet season has now arrived and while warm during the day it is much more pleasant. There has been lots of rain this year – this storm even brought flooding nearby our place. Drainage canal needed dredging to take all the water away. The regional damns are filling up so that is a good sign. While much of the busy times have been associated with my casual honorary consul role (see separate blog on that) our day-to-day lifestyle has also been enjoyable. We have not been able to take any trips away over the last couple of months with our time being spent at home and around Chiang Mai. The routine chores of house management and maintenance take up most mornings while also operating the consulate. Between phone calls and emails I try to do some gardening & chores while Ace takes on cleaning. The green season ensures the garden grows and it needs weekly bush and hedge trimming, grass cutting and tidying up. Maybe I should get someone in to do it – like others around us? As always there has been daily times with the dog and cats and enjoying exercise walks or bicycle rides for Lex. The annual animal vaccinations were in order so a trip to the vet was carried out – all good for another year. Lex and Lindsay also learned to share and were found eating dog food together – great mates it seems. We also found a nice dog place called Pawtel in Mae Rim, a drive of about 45 minutes away, that has a swimming pool for dogs. Lex had never experienced swimming, but after some quick lessons, he took to swimming and retrieving like nature golden retriever he is. Walks down a nearby country lane are always welcome by Lex as are the morning bicycle rides around the subdivision. Pets are great. Food is not expensive if you look around and enjoy simple cafes, restaurants, Thai market and street food. You can enjoy 5 star places and locations as well, lots in Chiang Mai, but we routinely enjoy the many simpler food offerings. For me its fun finding a few new locations each month such as the Fern Forest Cafe, Klerm & At Khualek cafe by the River in the city and visiting old favorites such as Scent of Coffee, near the Royal Garden project and Kad Farang complex in Hang dong. We enjoyed a roof top birthday party for an Australian and enjoyed an Aussie BBQ for the 2nd State of Origin game – the hair piece gives that away. Socially we have had a number of dinners out with friends, met an Australian living near us and been round to their place for a dinner party. Headed out with friends a to nice coffee cafe near us a few times, called Petite Cabane – nice homemade pastries, cakes and pies. We were also invited to attend a complimentary Indian film night by the Consul of India. It was a fun evening to experience a mythical film entitled Bahubali, shown at the Marjor Cineplex, Central Airport Plaza. Some pre-movie Indian food and drinks were offered & a chance to socialise with other guests. When arriving in Chiang Mai we had satellite TV installed but it has been less than satisfying in terms of channels and programs. So we have done away with that and moved to internet TV. With our internet fiber optic provider delivering 100/20 Mbps speed, the purchase of android boxes seemed a next logical choice. So there has been a nice learning curve for me to set up and install APK programs, Kodi and other provider apps – result seems to successful with lots of programs on offer. Australian TV programming makes us feel like we are still there…at times. Ok – now to set it up? We also had a trip to the Motor Vehicle Registry or Land Transport Department as its called here. For my work purposes we needed to change the registration of our Isuzu MUX from Ace’s name to mine. So how do you go about that? Easy, take documents to the LTD and fill out forms with copies, join the long queue for a vehicle inspection (2 hours) and then wait (40 minutes) for a report on vehicle safety and value. Go the service counter, get a queue number and wait again to complete the transfer paperwork, maybe 30 minutes as it was late in the day and most people had left. Pay the transfer tax and told to come back in 2 days for an updated registration book. Now with that complete and more forms filled out I am awaiting consular plates for our vehicle from the Embassy/Ministry of Foreign Affairs in about 3/4 weeks? July and ‘August, at this stage, are looking a little quieter so maybe we can get out-of-town and take time to explore more of our region in the North of Thailand – lets hope so. 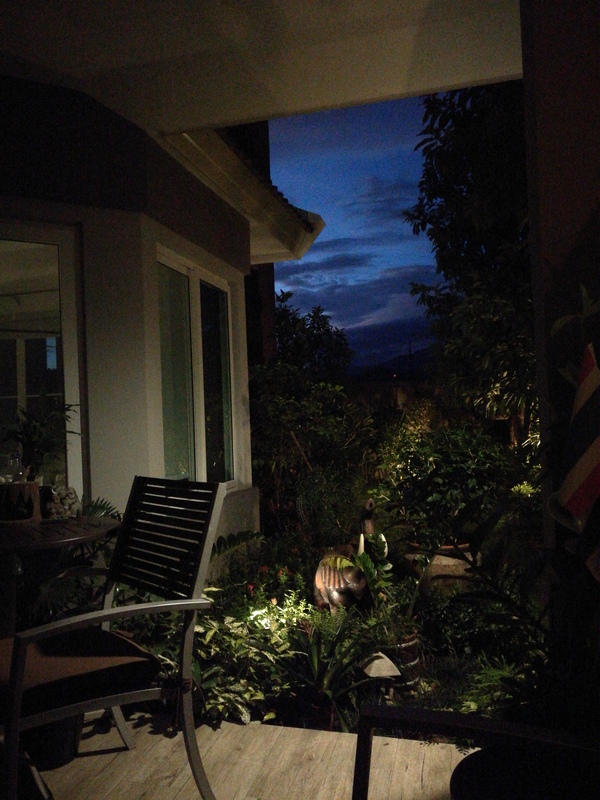 In the meantime, its enjoying our tranquil in Thailand life in our piece of paradise.